The Arctic is always in motion. The spin of the Earth and the changing seasons plunge the top of the world into frozen darkness in the winter then reveals a vibrant ocean full of life in the spring as air and water warm. Wildlife moves to this rhythm and the rich Arctic Ocean provides home for an amazing array of wildlife. 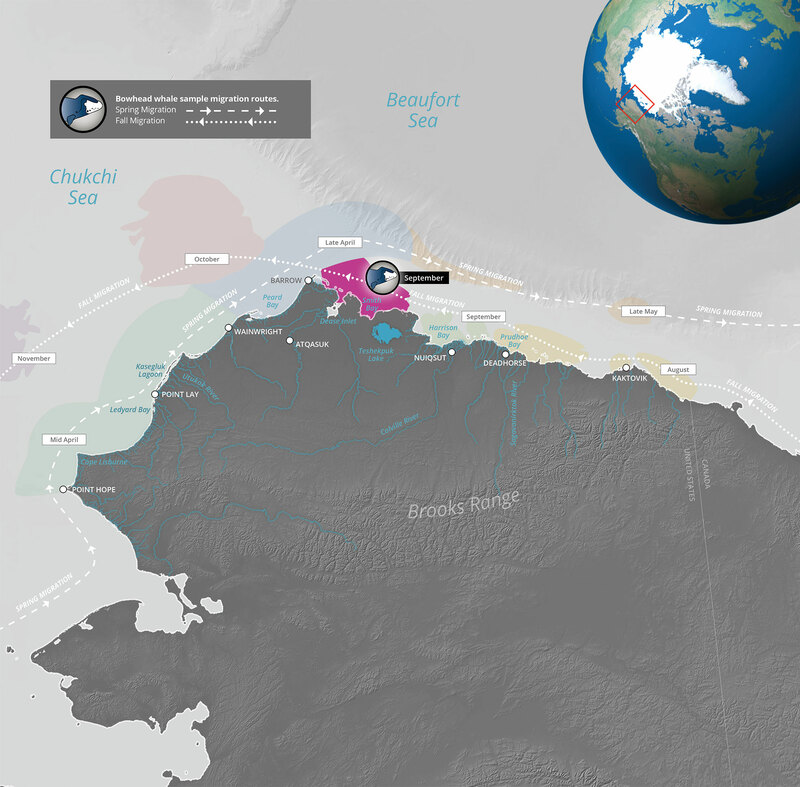 Within the immensity of America’s Arctic Ocean, there are special places in the Beaufort and Chukchi Seas where the currents, bathymetry and landforms concentrate wildlife, attracted to persistent sea ice and exceptionally rich waters. These places are critical to the survival of hundreds of species, providing food, shelter, and the connectivity that supports wildlife’ ancestral migratory journeys year after year. 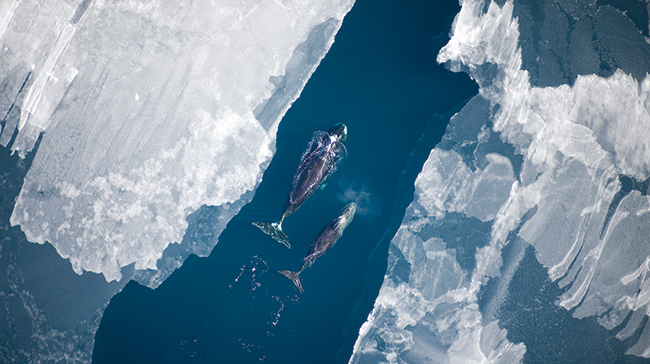 Ambassadors of the vast Arctic space, bowhead whales follow ancient migration paths that connect these jewels into a necklace of important marine areas. Brought to the brink of extinction by commercial whaling, the bowhead whale population had been reduced to just a few thousand animals at the end of whaling in the early 20th century. Since then, bowheads have been steadily increasing, with a population now standing at 17,000 animals. This remarkable recovery is a story of hope and resilience. The important marine areas of America’s Arctic are vital pieces of the complex habitat puzzle bowheads have evolved in for thousands of years. Few of us will ever have the chance to experience the bowheads’ kingdom first-hand – but America’s Arctic Ocean, including this necklace of Important Marine Areas, is resplendent with treasures we all share. Today, the rhythm of the Arctic is changing as polar regions warm twice as fast as the world average. The stress of shrinking sea ice, melting permafrost, and unpredictable ocean conditions is already impacting arctic wildlife. This stress to wildlife is amplified by human activities, including oil and gas development and increased shipping made possible by receding Arctic ice. The time is now to stand up and protect those vital marine areas that will keep the entire Arctic marine ecosystem healthy for future generations of bowhead whales, seals, polar bears, birds, and for all of us. In spring, the Arctic awakens from the long, dark winter. 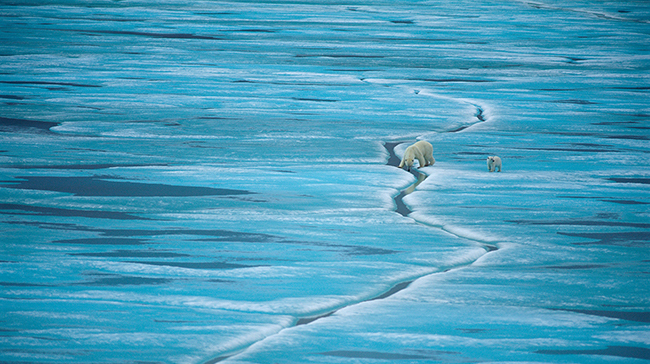 The ice starts to break and separate, and the Chukchi Corridor teems with wildlife. The combination of sea ice dynamics and regional currents drives the emergence of recurring leads and polynyas—areas of open water surrounded by sea ice—that attract a high number of Arctic species that come here to feed, rest, nest, socialize, and migrate north from the Bering Sea to the Chukchi Sea through this strip of water. Bowhead whales emerge from their wintering grounds in the Northern Bering Sea, where they have lived along the ice edge for several months. The whales move northward, following currents and leads, the highways of the seas, along the same ancestral routes that will eventually take them to their summer residence in the Canadian Beaufort Sea. With a massive bow-shaped skull that is more than five meters long and about a third of its body length, a bowhead can break through thick ice to breathe. In the Chukchi Corridor, they are joined by another majestic marine mammal, the Pacific walrus, also migrating north along the ice to summer feeding areas. From April to June, many walrus females with newborn calves can be seen streaming through the Corridor. Meanwhile, polar bears follow the pulses of the ice from late April to midsummer, looking for seals to hunt. Above the water, millions of birds refuel in the Chukchi Corridor before continuing their spring migratory journey to the breeding grounds. 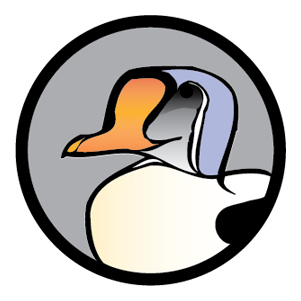 Spectacled and King eiders and long-tailed ducks dive to the bottom to find clams, mussels, and other benthic invertebrates. 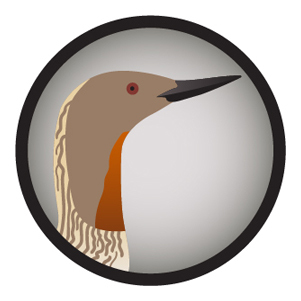 As the season progresses, more birds join the flow in the summer, from the fish-eating red-throated loon to the ancient murrelet, a new visitor to the Chukchi Sea. Thousands of shorebirds dot the barrier islands. 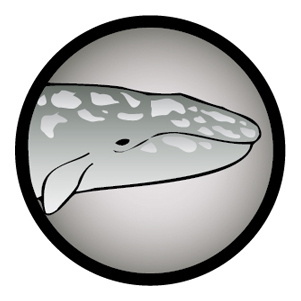 Gray whales move into the area between July and October to feed on amphipod crustaceans at the bottom. Other subarctic cetaceans, including humpback, fin, and minke whales, visit the southern part of the Chukchi Corridor. In the spring, more than 15,000 bowhead whales migrate around the tip of Point Barrow from the Chukchi Sea into the Beaufort Sea. Females bring newborn calves that undertake the journey for the very first time. Female ringed seals give birth under snow layers. 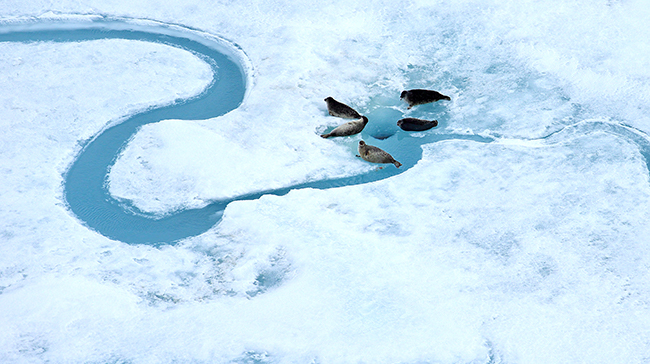 As the ice breaks up and rays of sun warm up the area, bearded seals bask on the ice. Polar bears cruise the ice leads, stalking seals at breathing holes. Hundreds of beluga whales cruise by, on their way to the Beaufort Sea. Above their heads, king eiders fly past Point Barrow in large flocks. Gray whales arrive through the unending days of summer to feed on arthropods in the rich seafloor, trailing plumes of mud as they surface. In the fall, bowhead whales return to Barrow Canyon. The tiny calves that were first brought by their mothers in the spring have put on weight and now look robust and plump. 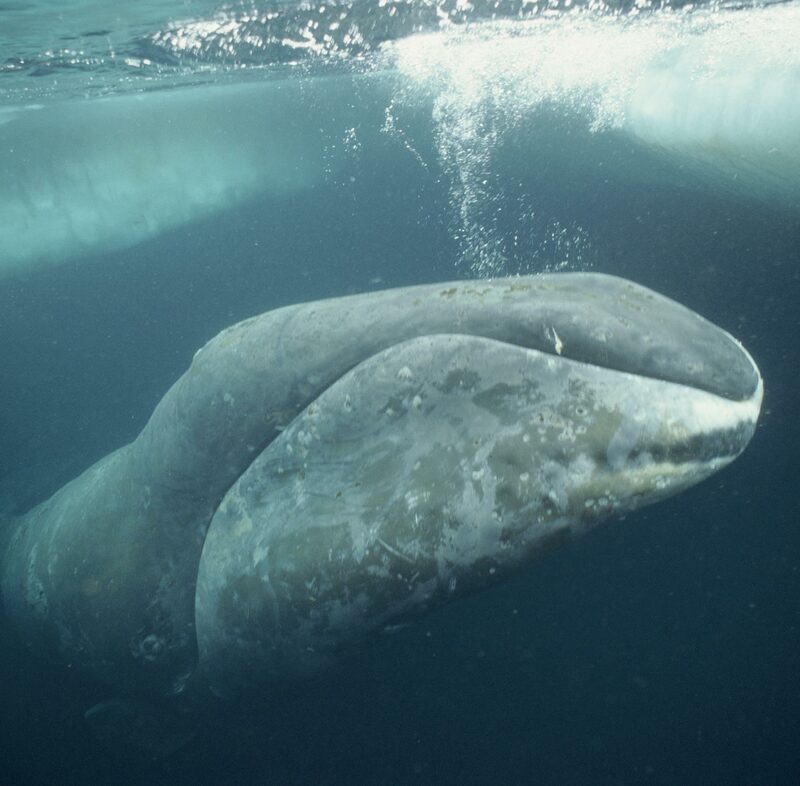 Bowhead whales begin to reproduce when they are 25 years old. Pregnancy lasts 13 to 14 months, and calves may be born every three to four years. At birth, a calf weighs one ton and is about 13 feet long. Calves nurse for six to nine months. East winds promote the upwelling of nutrient-rich water and krill onto the shelf near Barrow. If the east winds relax, the krill become “trapped” in densities that provide a nourishing stew for bowheads and other wildlife in the summer and the fall. The bowheads pause their fall migration and engage in a feeding frenzy off Barrow. The leviathans swim on their sides with mouths wide open, pushing their long baleen through dense aggregations of krill. Birds join in the feast and feed along the bowheads. 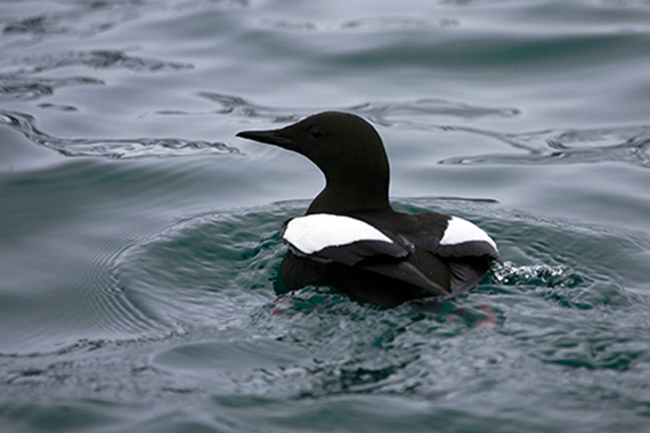 Kittlitz’s murrelets, common murres, and black-legged kittiwakes are just a few species seen. Ross’s gulls eat so much krill that they turn bright pink, giving these white gulls the unusual appearance of tropical birds. Against the backdrop of this magical wildlife spectacle, the village of Barrow—once again called by its Inupiaq name, Utqiagvik—can be seen in the distance, a reminder that Barrow Canyon not only is a place for whales and birds to congregate, but also supports a community that has relied on the bounty of the sea for millennia. By early November, the sea ice begins to re-form, and the winds are less favorable to the fertile mixing of prey species. This is the signal the bowheads are waiting for. They have replenished their energy stores and leave the Barrow region to continue their migration. They will return the following spring. The Beaufort Shelf Sea Break is a busy place in the summer and the fall. Beluga whales start congregating in the area in July to take advantage of the oceanographic conditions that create upwelling and bring good feeding opportunities. The white whales will spend the next three or four months gorging on Arctic cod, diving at depths between 200 and 400 meters to catch the fish that are the densest at this depth. In September, the Eastern Chukchi Sea beluga population, which numbers about 3,500 animals, is joined by the Eastern Beaufort Sea population, much bigger in number at about 30,000 whales. 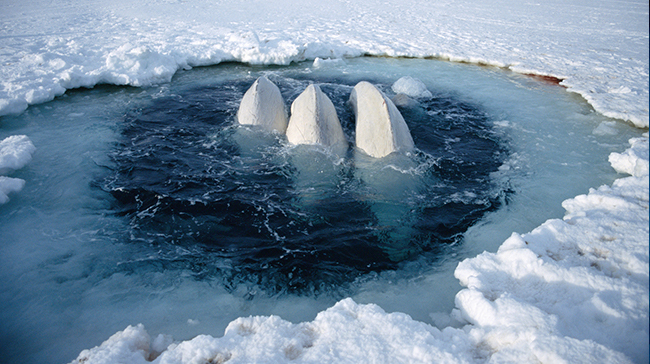 At the surface, their bright whiteness matches the ice floes around them. Beneath the water, the animals’ vocal exuberance fills the space with their vast repertoire of sounds, chirps, whistles, clicks, squeaks, grunts, and screeches. By October, the last belugas are vacating the Beaufort Shelf Sea Break to continue their migration to their wintering grounds. During the fall, belugas rarely cross paths with bowhead whales, which are feeding in shallower waters close to shore. 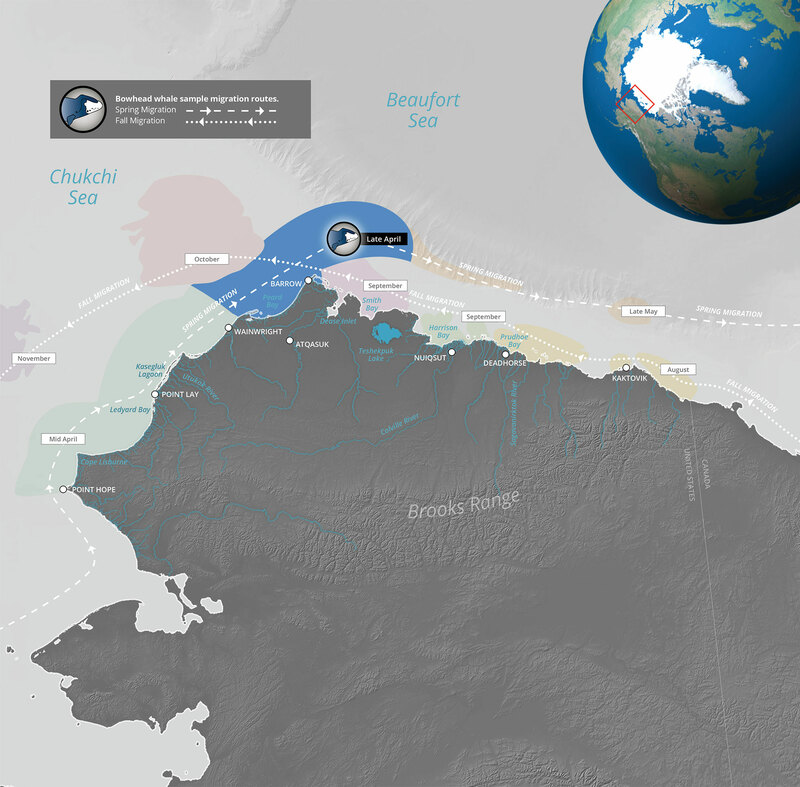 However, in the spring, the Beaufort Sea belugas follow migration patterns similar to the bowheads’. In the late spring, bowheads travel through the Beaufort Shelf Sea Break during their migration east, as they head out to the Canadian Beaufort Sea, where they spend the summer. If the whales encounter a good food patch, they will stop and linger in the area, even until the summer months. In the quiet, cold winter, a lot is happening within and under the ice. Female polar bears are in their dens, waiting to emerge with new cubs. 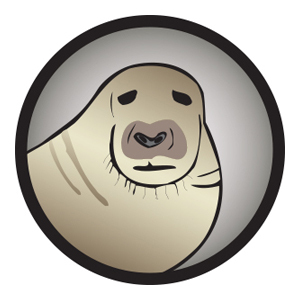 Ringed seals are keeping warm in snow-covered dens above breathing holes in the ice. 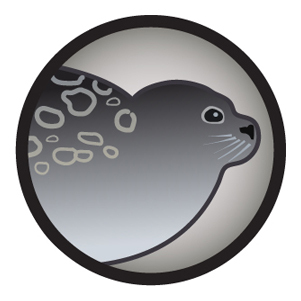 Year after year, the seals return to those same breathing holes and lairs. Along this coast, the predictable stability of the ice and snow is a key factor to the ability of ringed seals to successfully raise their young. It is in those snow caves that females give birth to pups in late winter or early spring. They are well protected from not only the freezing cold but also their main predator, the polar bear. The dens are under snow so deep that bears cannot easily crush the roofs. As the temperatures begin to warm and the snow covering the lairs melts, ringed seals venture out to enjoy the sunlight. In May and June, they are basking on the ice while molting - remaining vigilant for polar bears. As the sea ice breaks up during the summer, ringed seals spend much of their time in the water feeding again, sometimes wandering over thousands of kilometers. During their travels in search of food, ringed seals may encounter bowhead whales that are traveling on their fall migration westward between Demarcation Bay and Oliktok Point. Large bowhead calves are often seen with their mothers in the area. This is the time to build fat reserves and get ready for the winter. Occasionally, environmental conditions lead to enhanced feeding opportunities. 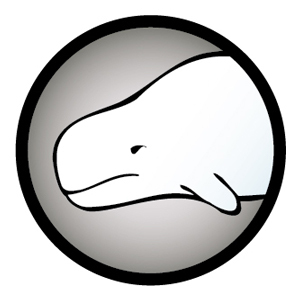 From late August through September 2014, large numbers of bowheads were observed feeding within 5 km of the shore, from Oliktok Point to Camden Bay, possibly because of high freshwater river discharges combined with upwelling winds that created fronts and served to aggregate bowhead whale prey. In the Beaufort Sea, the Harrison Bay-Colville River Delta region is a bird’s paradise, a gathering place where the river meets the ocean, and where seals, polar bears, and birds converge. The Colville Delta is so flat that one cannot tell where the river ends and the ocean begins. As one of the Arctic’s longest and largest rivers, the Colville River drives biological productivity. 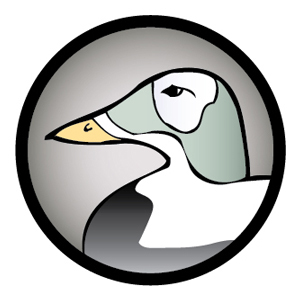 The mixing of saltwater and freshwater brings nutrients that attract an abundance of birds in one of the highest densities in the Beaufort Sea. Raptors such as peregrine falcons, golden eagles, and rough-legged hawks occupy the cliffs banks of the river. In the spring, large migratory flocks of spectacled and king eiders visit Harrison Bay in the thousands to fatten up before the breeding season. In the fall, they are back on their molt migration to recover from the hard work of breeding. They linger in the area for a couple of months, diving to the bottom to scoop clams and other bivalve mollusks. 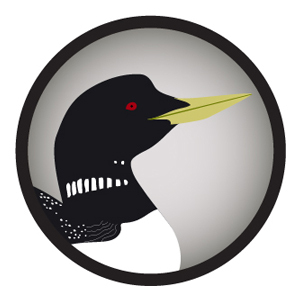 Black brant, yellow-billed and red-throated loons, nest and feed in the region. Many other species of shorebirds and waterfowl also visit. Not far away, spotted seals gather at a coastal haul-out in the eastern delta. In October, as the temperatures get colder and the birds leave for their wintering areas in the Bering Sea, female polar bears are ready to set up their dens in the coastal bluffs lining Harrison Bay. Year after year, they return to this area, which provides a quiet and safe shelter away from other bears and human activity. As a shallow-water estuary, Smith Bay has a unique ecology. 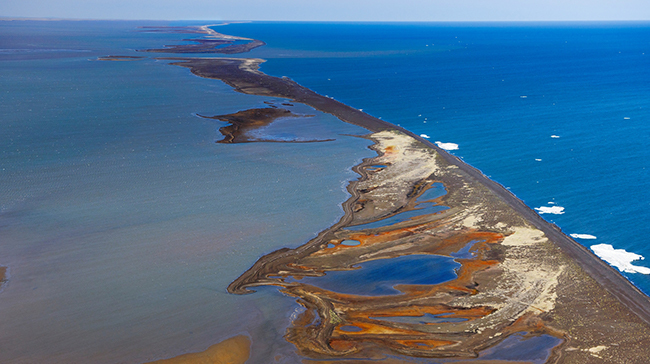 Smith Bay is bordered by barrier islands that separate the shallow waters from the Beaufort Sea. Several slow-moving rivers flow into this region. From whales and bears to tiny, delicate shorebirds, Smith Bay supports a wide variety of wildlife. 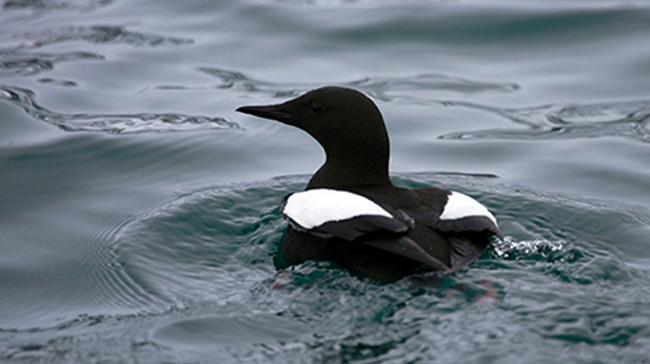 In the spring, black guillemots arrive at Cooper Island, at the western edge of Smith Bay. These small seabirds come to the island each year to nest and raise their chicks, feeding on small fish and invertebrates in the rich waters of Smith Bay. Their abundance is a powerful indicator of the health of the ecosystem. This is the time when yellow-billed and red-throated loons find lakes and ponds in which to nest in the rich river delta system. Large flocks of king eiders also stop by Smith Bay in the spring to refuel before they are off to their breeding grounds. They will be back in the late summer for more feeding before taking off again on their migratory journeys. In late summer and fall, bowhead whales stop by the greater Smith Bay area to add more fat to their thick blubber — up to nearly half a meter — thicker than any other whale’s blubber. They will leave the area having replenished their energy levels to face the journey to their wintering areas. Bowheads are very familiar with this hot spot. 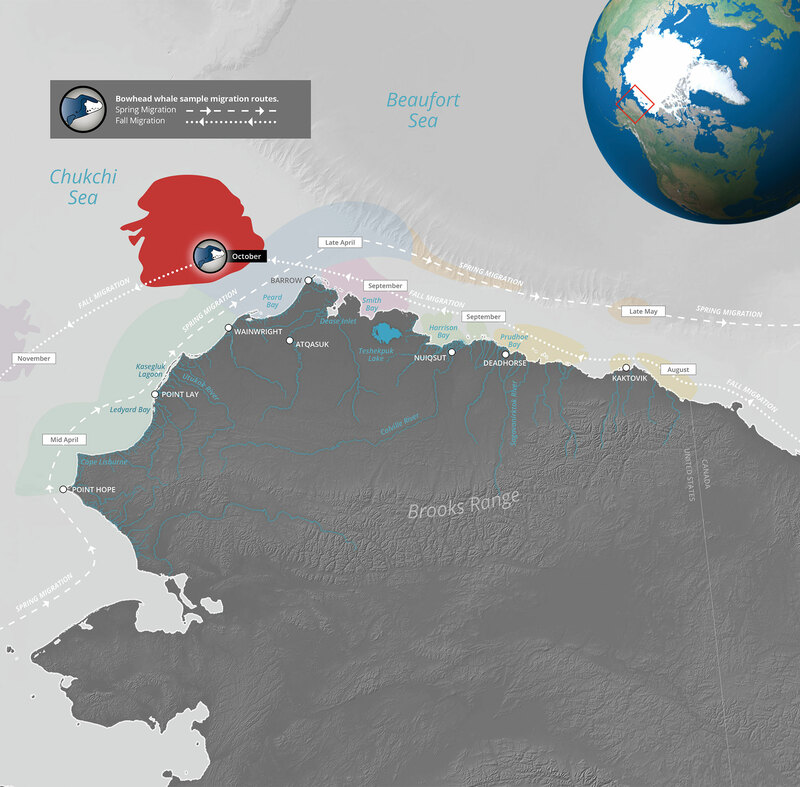 Krill that has been advected north from the Bering Sea can become “trapped,” and under certain oceanographic conditions, hundreds of bowhead whales can be feeding in the area from late August through late October. The landscape truly looks like “bowhead soup,” with animals surfacing everywhere, their huge, gaping mouths plowing through the water. 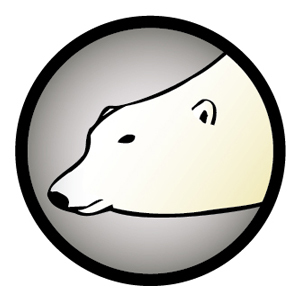 Another powerful arctic animal, the polar bear, visits Smith Bay to hunt ringed seals. Between October and December, female polar bears come to shore to the barrier islands to look for suitable denning areas with good snow accumulation along coastal bluffs. In the dens, they give birth and raise their young. The next spring, they will emerge with the cubs and will be on the move again, looking for hunting opportunities. Located 100 miles offshore from Alaska’s northwestern coast, Hanna Shoal is a year-round hot spot for diverse arctic wildlife, from tiny seabirds to the powerful Pacific walrus, which can weigh up to two tons. With its seafloor contours that steer away warm waters, Hanna Shoal is one of the last places that holds sea ice in August and September, when all other ice melts or recedes. 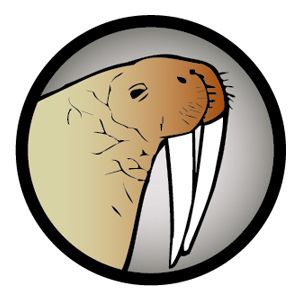 Hanna Shoal is walrus paradise. Thousands of animals start to arrive in June and will hold onto the sea ice as long as they can throughout the summer season. The floating ice that the walruses use as a resting platform sits above some of the most productive waters of the eastern Chukchi Sea. Walruses dive to the muddy bottom, at depths of between 50 and 100 meters, to feast on the rich beds of clams and other benthic invertebrates. In a time of dramatic sea ice loss, polar bears also take advantage of the lingering ice as a critical platform from which to hunt bearded and ringed seals. When the warm Bering Sea water runs into the cold Chukchi Sea water around Hanna Shoal, the interplay of water masses concentrates zooplankton in great densities easily accessible by seabirds. 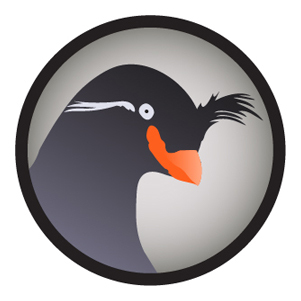 By early August, crested auklets have arrived. 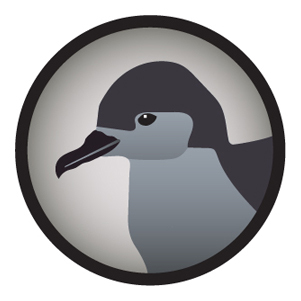 By mid-August, they are joined by millions of short-tailed shearwaters that have traveled around the world to feed. Kittlitz’s and ancient murrelets, phalaropes, and Ross’s gulls soon join the feast. The great pulse of birds doesn’t last long. Within six weeks, the congregations start to disperse, and the birds are all gone by late September. This is also the time when the ice finally disappears from Hanna Shoal and the walruses move to shore. Some animals will still continue to make regular trips to the area. On their way, they may meet bowhead whales that swim past Hanna Shoal in September and October during their fall migration. 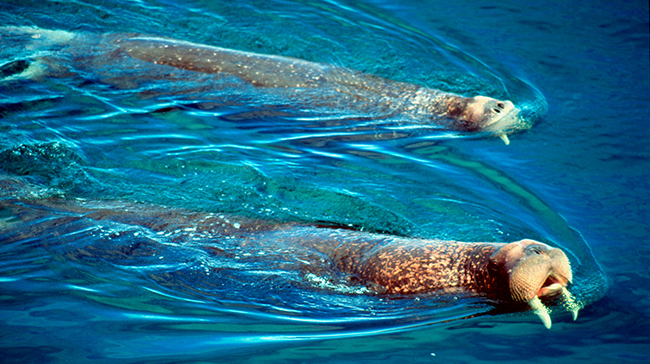 In the late summer and fall, walruses may also encounter gray whales that are feeding in the southern part of the Hanna Shoal region. With its lingering sea ice in the summer, Herald Shoal is the place to be for ice-dependent species. 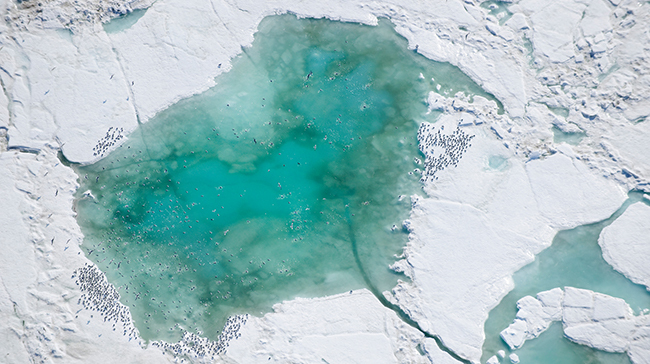 Because Herald Shoal concentrates both ice and food in one place, it is a critical stop for walrus. The animals gather in large numbers between April and June to feed on rich diet of clams and other seafloor invertebrates supported by the shallow, productive waters of the region. Polar bears are also there during the spring to hunt bearded and ringed seals on the ice. In a warming climate where ice becomes scarce and recedes earlier every year, Herald Shoal’s persistent ice allows the bears to extend their hunting season into the summer and gives them a critical energy boost when they need to build enough fat reserves to withstand the fasting period. Each spring, these long-lived leviathans migrate from wintering grounds south of the Bering Strait to summer in the food-rich waters of the Beaufort Sea. During the shortening days of autumn they return westward ahead of advancing sea ice. Their ancient pathways pass through some of the Arctic Ocean’s most biologically rich and ecologically essential waters. Follow their progress as they guide us through these remarkable places. Includes over 250 miles of coastline between Point Hope and Wainwright. At 3 million square miles it’s area is roughly equal to the state of Wisconsin, minus the cheese. Of all the IMAs, the Chukchi Corridor is the most important to beluga whales and their jazz instruments. 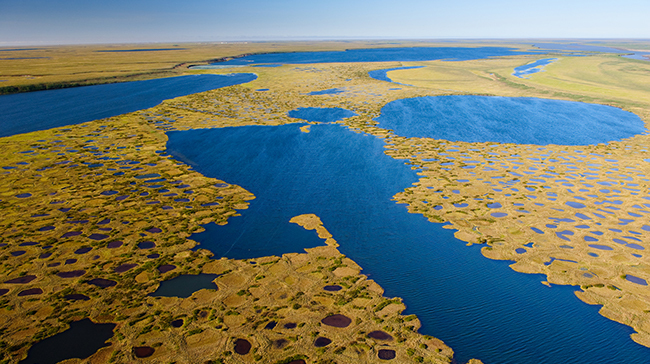 Kasegluk Lagoon hosts a billion nesting birds.